The Cow Hooves - Front Pair come as a pair as pictured. Available in One Size Fits Most. These delightful Black and White Hooves wear similar to a pair of mittens. The elastic band about the opening allows for many sizes of hands to fit comfortably. Perfect for school plays and musicals, and for dressing up and having fun. 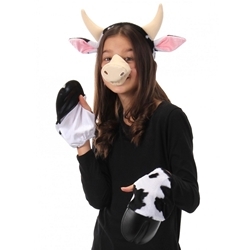 Pair with Cow Hooves - Front Pair and Cow Animal Nose to complete your barnyard look!